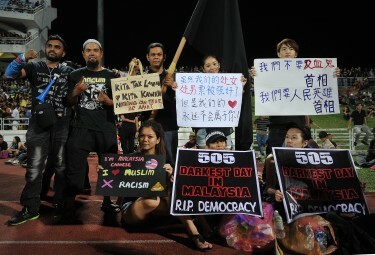 The Opposition-led ‘Black 505’  rallies are spreading in Malaysia. On May 8, 2013, tens of thousands gathered in Kuala Lumpur, the country’s capital, to protest the outcome of the recent election which gave the administration coalition a slim majority. 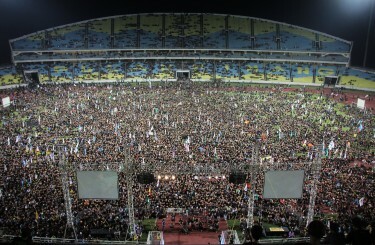 Three days later on May 11, another massive rally was organized  in Penang which was attended by more than 80,000 people. In Ipoh , 30,000 joined a similar protest. Rallies were also held in Kedah and Perak. ‘Black 505’ refers to the May 5 General Election which was tainted by allegations  that the ruling Barisan Nasional (BN) coalition committed massive electoral fraud to remain in power. BN lost in the popular voting but it still retained majority of the parliament seats. BN has ruled Malaysia since the 1950s. 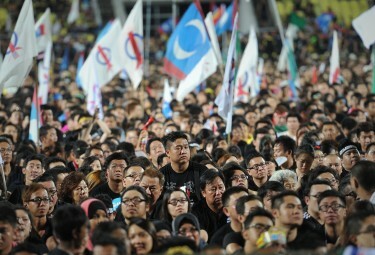 I am very happy to hear that 85 percent at the rally were young Malaysians. It gives me hope that what we may not achieve now will be achieved by them. We need to change, to be truly Malaysians. Ubah! I think the BN government should sit up and take note of the large crowd and do something more positive than keep harping on race. The commenter might be referring to the remark of the Prime Minister who blamed Chinese voters  for the loss of several administration candidates. ‏@atinjiha91  Expressing your anger won't change anything. Let's unite together to form a better nation. @NgConnie  #black505 and you, making our bond even stronger. not chinese/ malay/ indian bond. its the bond between Rakyat. it's us. please respect the majority of Malaysians who voted for the govt to continue its transformation agenda and I still respect the opposition who won Penang, Selangor and Kelantan. Sincerely,a Malaysian who loves peace,progress and 1Malaysia. This was the day that a lot of Malaysians participated in #black505. A talk to show our fight for democracy, to be a part of the protest of our 13th General Election here in Malaysia. During that event, we were advised to wear black as a sign of our dying democracy here in our country. A sign of protest too. The amount of people who went was just truly amazing. At such big events, we would usually find people pushing, drivers honking and asking us to move out of the way but no. Everyone helped each other and give in for others to walk. There were no signs of pushing or impatient acts. Indeed it was a fantastic sight to see people gathered, just for the sake of our country's clean future. …allegations of electoral fraud should be channelled through the appropriate institutions, i.e. Courts of Law. However, tainted they may be or perceived to be such, those institutions are all we have at the moment. …rallies are doomed to fail, as momentum fizzles out quickly, message lost, incurring only public condemnations at the end.